Buckingham Palace, the London residence of Her Majesty The Queen, is one of the few working royal palaces remaining in the world today. As the administrative headquarters of the Monarch, Buckingham Palace is also used as a venue for Royal Ceremonies, State Visits and Investitures. The nineteen State Rooms at Buckingham Palace, which are used regularly, for official and State entertaining, by The Queen and members of the Royal Family are mainly in the west wing facing the gardens. The Summer Opening at Buckingham Palace gives you the chance to see inside and explore the lavishly furnished State Rooms and walk through the gardens which are as stunning as the building. The State Rooms at Buckingham Palace are open to the public this year from Saturday, 20 July to Sunday, 29 September 2019. Your tour of the State Rooms begins at the Grand Entrance which is normally reserved for foreign ambassadors and diplomats, and there is a lot to see. Your journey takes you through the same rooms used by The Queen and members of the Royal Family to receive and entertain their guests on State, ceremonial and official occasions. Each year the Palace's summer opening features an exclusive special exhibition as well as the priceless works of art and exquisite furniture from the Royal Collection that adorn the State Rooms. Suggested visit duration: 2 to 2.5 hours. Entry is timed, but you are free to visit at your own pace. An audio guide?to the Palace is included in the ticket price. 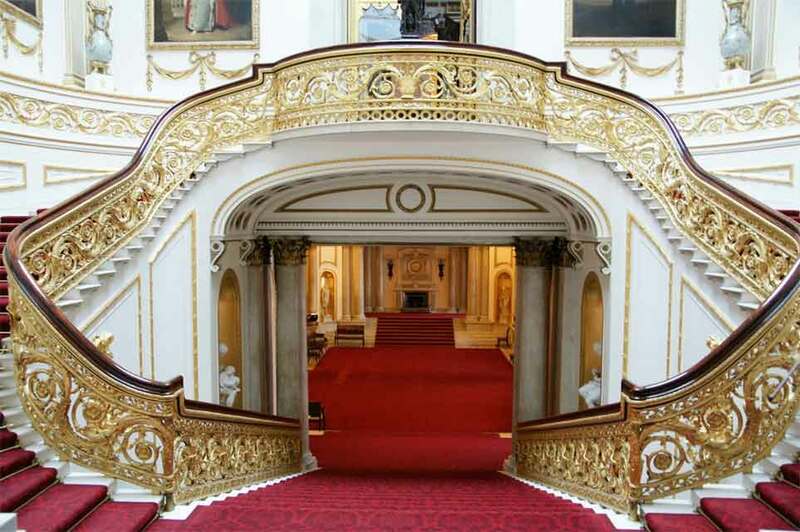 Introduced by His Royal Highness, The Prince of Wales, (Prince Charles) this guides you through the State Rooms as well as the annual special exhibition.? Audio guides are available in English, French, German, Spanish, Italian, Japanese, Brazilian Portuguese, Russian and Mandarin. On arrival, you and your belongings will be subject to airport-style security checks. Some items such as large items of baggage, backpacks and pushchair's will have to be checked in and reclaimed at the end of your visit. Photography, video recording and filming, including the use of wearable devices for non-commercial purposes, are not permitted inside the State Rooms. Photography and filming for non-commercial purposes are allowed in the garden of Buckingham Palace. Mobile phones must be switched off inside the State Rooms. For safety reasons, pushchair's cannot be taken into the State Rooms. They must be checked in and reclaimed at the exit. Baby carriers and hip seats can be borrowed, subject to availability, free of charge. Admission is scheduled for the time stated on tickets and latecomers will not be admitted. Planning to visit the State Rooms and watch the Changing of the Guard on the same day? Is The Queen At Home? 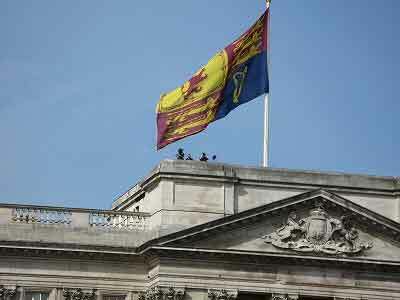 When the Royal Standard, is flying, from the flagpole, over the Palace you know Her Majesty The Queen is at home. You will also see four Foot Guards on sentry duty at the front of the Palace when the Queen is in residence, and only two when she is away. When the Union Flag flies above Buckingham Palace, Windsor Castle or Sandringham House it signals that the Queen is not in residence. Buckingham Palace has been the official London residence of Britain's sovereigns since 1837. Queen Victoria was the first Monarch to take up residence in Buckingham Palace. The familiar and much photographed view of the Palace is the East Wing. The State Rooms are behind in the West Wing. The Palace, measuring 108 metres across the front is a 120 metres deep, including the quadrangle, has a total floor area exceeding 77,000 square metres. 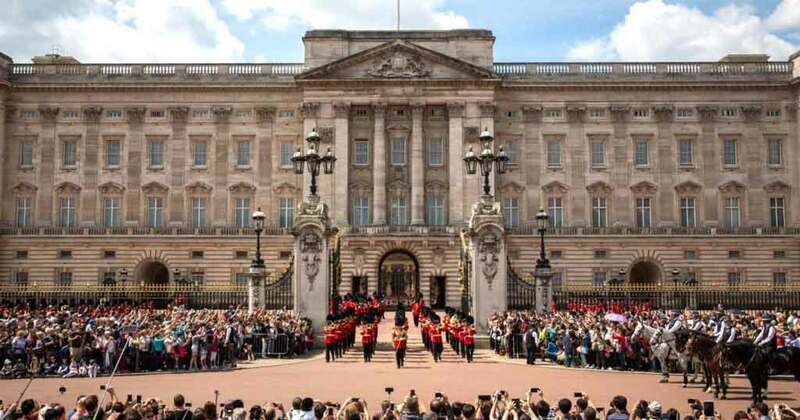 Inside Buckingham Palace there are 775 rooms including 19 State rooms, 52 Royal and guest bedrooms, 188 staff bedrooms, 92 offices and 78 bathrooms. The largest room in the Palace is the Ballroom, where Investitures and State banquets take place today. It is 36.6m long, 18m wide and 13.5m high. It was opened in 1856 with a ball to celebrate the end of the Crimean War. The Palace's garden, which covers 40 acres, which has a helicopter landing area, a lake, and a tennis courts, is used for summer garden parties and has been the setting for charity events. More than 50,000 people visit the Palace each year as The Queen's guests at banquets, lunches, dinners, receptions and garden parties. Over 800 members of staff work at Buckingham Palace. Marble Arch, originally at the entrance to Buckingham Palace, had to be moved to its present site, near Speaker's Corner, when Queen Victoria added the East Wing. in the 1840s. The forecourt, where Changing the Guard takes place, was created in 1911, was part of a scheme to commemorate Queen Victoria. The gates and railings were also added in 1911. In addition to being the London home of The Queen and The Duke of Edinburgh Buckingham Palace is also home to The Duke of York, The Earl and Countess of Wessex, The Princess Royal and Princess Alexandra who have private offices and apartments located within Buckingham Palace. Buckingham Palace was built in 1702 by the Duke of Buckingham as his London home. The house was then later sold to George III in 1761 by the Duke's son. In 1774 it was renamed "Queen's House" as Queen Charlotte resided there. The Palace has of course seen many renovations and alterations, the first of which was in 1820 when John Nash was commissioned by George IV. Nash, one of the foremost architects of the day added a new suite of rooms facing west into the garden, this doubled the size of the building. 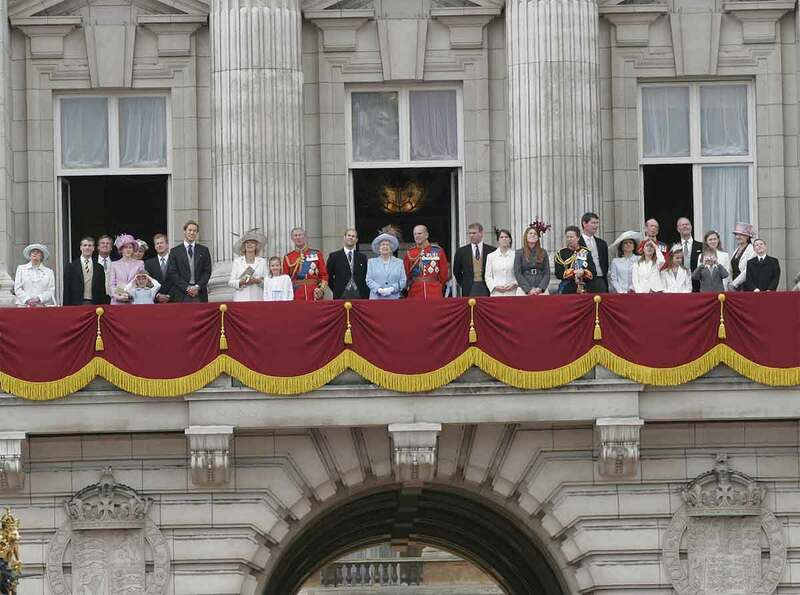 Queen Victoria, who was the first monarch to take up residence in Buckingham Palace, in 1837, made extensive changes including the East front which contains the well-known balcony on which the royal family traditionally congregates to greet crowds outside. The Portland stone facade, that overlooks the Mall today, was added during the reign of King George V with works being completed in 1914. 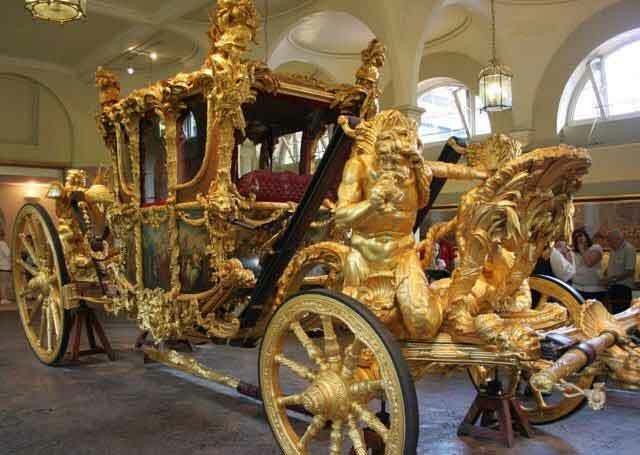 The Royal Mews at Buckingham Palace is one of the finest working stables in existence and home to the royal collection of historic coaches and carriages. Responsible for all road travel undertaken by the Royal Family a visit to the Royal Mews lets you see what it takes to keep the Royal Family on the move! The most dazzling of all the coaches on display is the Gold State Coach, last used during The Queen's Golden Jubilee celebrations in 2002. The Royal Mews is closed during State Visits and Royal Events. An exhibition of the art and treasures, from the Royal Collection, held in trust by the Queen. Typically a visit lasts 1 and 30 minutes. Tickets can be obtained from the Royal Collection. Not recommended, Buckingham Palace is in the congestion charge zone. Valid on London Underground, buses, trams and the Dockland Light Railway (DLR). More?Royal Palaces and Castles?in the UK you can visit and experience first hand the rich history on a of some of the of the world's most iconic buildings.